Lock in a great price for Bla Hostel – rated 8.4 by recent guests! Close enough to the main street. Has a kitchen. They gave me a discount code for an airport transfer. The staff helped me to get a cab to bus terminal when I requested. It is fairly close to the main road in El Calafate. Really available staff, good atmosphere. Excellent value for money. Well located right in the town. Friendly staff. Good breakfast. Nice area to relax inside and out of the hostel. The atmosphere and common areas were great, staff was super friendly, this could be a really good place to stay if it wasn't for the noise levels! Breakfast was decent. Check in staff was helpful. Quiet. Near Main Street. The directions from the bus station are difficult because there are few street signs. Overall the property supplied my needs. Funky. Cool. Good vibe. has kitchen, arranged our tour and airport transfer. Nice comfortable rooms, big kitchen, good breakfast, close to the center, and very nice and helpful staff! Bla Hostel This rating is a reflection of how the property compares to the industry standard when it comes to price, facilities and services available. It's based on a self-evaluation by the property. Use this rating to help choose your stay! One of our best sellers in El Calafate! 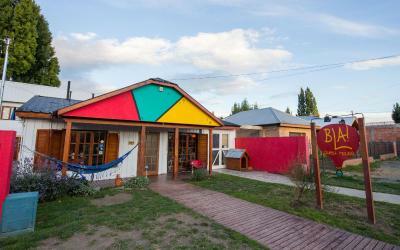 Set against an impressive Patagonian Mountain backdrop, Bla Guest house is a quaint guest house in downtown El Calafate. It features white and honey wood exteriors and is conveniently located only 2 blocks from San Martin Avenue, the main commercial street. 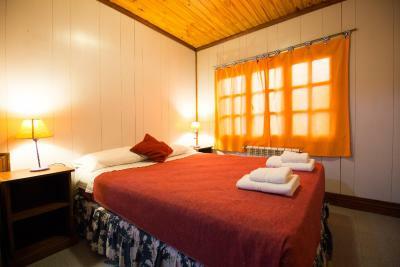 Rooms at Bla Guest house have polished wood walls and queen-size beds. All are equipped with heating and have private bathrooms. 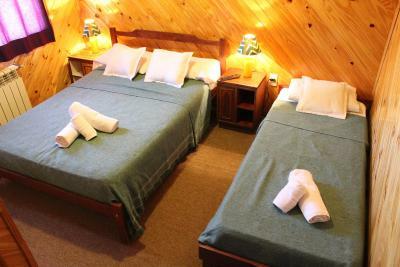 Guests at Bla Guest house can enjoy a picturesque boat outing on the Argentino Lake or visit the Perito Moreno Glacier. Trekking, fishing and horse riding activities can be booked at the tour desk. A continental breakfast is served daily. Due to its central location the Bla Guest house is surrounded by lively restaurants and bars. This is our guests' favorite part of El Calafate, according to independent reviews. 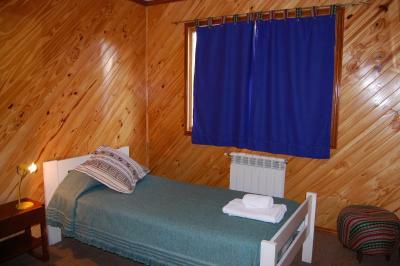 This property also has one of the top-rated locations in El Calafate! Guests are happier about it compared to other properties in the area. 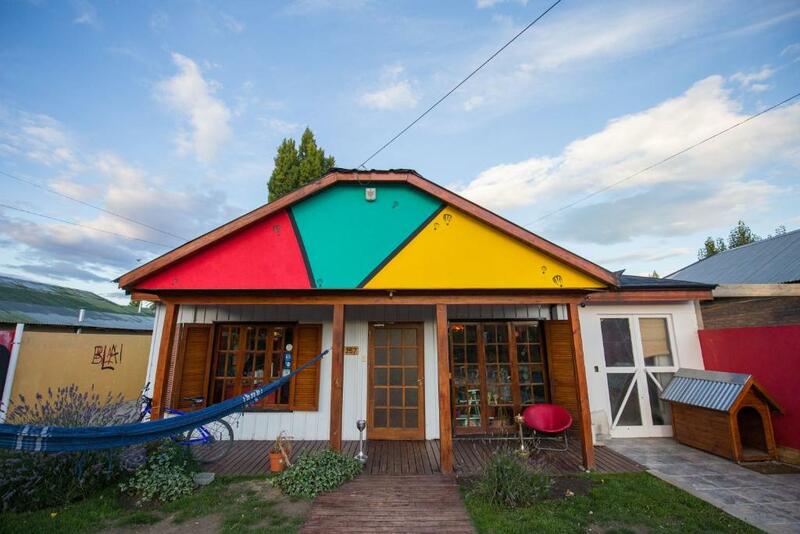 뀐 Located in the top-rated area in El Calafate, this property has an excellent location score of 9.1! When would you like to stay at Bla Hostel? This room features a private bathroom, high quality linen, cable TV, free Wi-Fi and heating. This room features 1 double bed and 1 single bed, a private bathroom with shower and bathtub, cable TV, free Wi-Fi, nightstands and heating. Bed linen and toiletries are included. 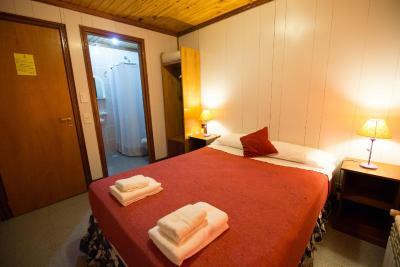 This room features an private bathroom, heating and free Wi-Fi. This double room has a microwave, dining area and electric kettle. This bed in dormitory has a kitchen, microwave and dining area. This double room has a oven, dining area and computer. Bla! 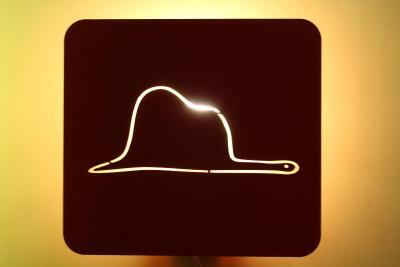 guesthouse is a full of joy and entertainment space, we are delighted to show our guests the beauty of our home. We offer cozy accommodation, breakfast, 24 hs service and touristic information at the front desk. House Rules Bla Hostel takes special requests – add in the next step! Bla Hostel accepts these cards and reserves the right to temporarily hold an amount prior to arrival. Please inform Bla Hostel of your expected arrival time in advance. You can use the Special Requests box when booking, or contact the property directly using the contact details in your confirmation. We were super happy and.want to book again in future. Really friendly staff, very cosy place, great breakfast! I enjoyed it! Wish we could have some eggs for breakfast. We didn't have any ARS currency when we checked in but Anna told us we can pay later. That was a great time saver and she even offered us delicious Alfajores. Can be occasionally loud and hot in the rooms but that's a small complaint! Well-situated, clean hostels with good shared space. Breakfast was quite simple. We weren't allowed to use the kitchen until 12 even after breakfast was over. So we couldn't boil some eggs to compensate for the basic breakfast. And the way in which we were asked to leave the kitchen was a bit abrupt. Nice cozy, warm place. Friendly fellow travelers. The room was comfortable with everything we needed. Small cramped rooms, heaters didn’t turn off, tired bathrooms, kitchen not well equipped, wifi disconnects as soon as you lock your phone and you have to re enter. Helpful staff to book excursions and taxis. Good location just off main street. Breakfast basic but good. we had a double room which was quite small and the double bed was extremely narrow. In Addition the room was very warm so sleeping was a challenge. The breakfast was really good and the staff generally helpful. The community area is quite nice. Kitchen like a scrum, doors slamming and every foot step seems to shake the room. Not much. Everything was perfect. Location, facilities and everything can be booked from the reception and all tours get picked up from the door. I think for the price for the stay it was pretty much everything we expected. The only thing about the room was the mattress didn’t quite fit the bed frame so it was a bit saggy. Room was also on the warm side. Centrally located to the main street (where all the shops and restaurants are), but just far enough away that it is quiet. Not too far from the El Calafate Bus terminal. Cab ride only costed 130 pesos. Also really liked the common kitchen, very useful. Our room was small but had a private bathroom and was clean. The staff was super helpful! The lady who checked us in also helped us book our boat tour to see the many glaciers around Calafate (Uppsala, Perito Moreno and a few more). We are happy to have stayed at Bla guesthouse and would recommend it! The staff were really friendly and welcoming, as well as offering useful local advice. The communal area was a good place to relax. Breakfast was fantastic.